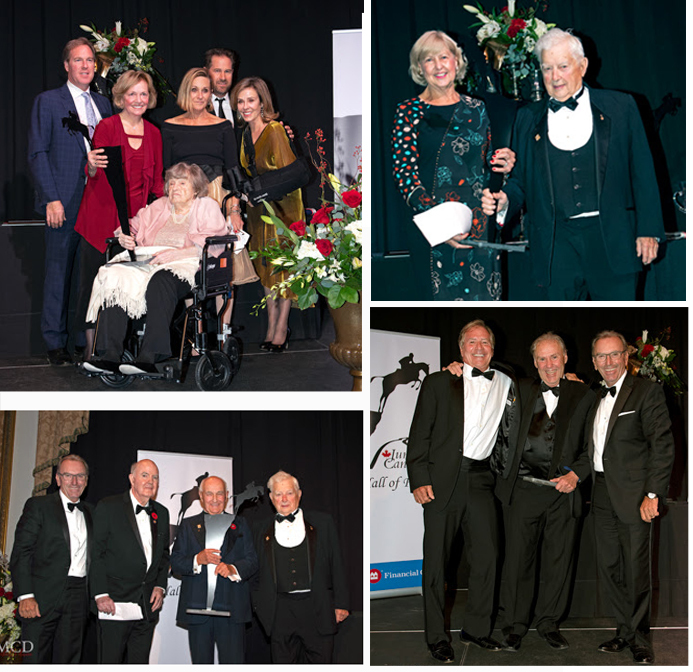 Four new inductees were welcomed into the Jump Canada Hall of Fame at the 11th annual Induction Ceremony and Gala, presented by BMO Financial Group, held Sunday evening, November 4, 2018, at the Liberty Grand in Toronto, ON. The Jump Canada Hall of Fame Gala is an annual favourite highlighted by tribute videos commemorating each inductee’s contributions to the Canadian hunter/jumper industry. Friends, coaches, teammates, and family members presented the distinct Hall of Fame awards to this year’s inductees, making for a very special evening recalling great memories and accomplishments in the sport. Induction and acceptance speeches ran the gamut from factual to humorous to poignant. The Jump Canada Hall of Fame was created in 2006 to recognize outstanding contributions to hunter/jumper sport. Including the class of 2018, 57 champions have now been welcomed into the Hall of Fame, including 21 horses and ponies, 29 humans, six organizations, and five teams. With BMO Financial Group’s generous commitment to continue supporting the Jump Canada Hall of Fame Gala, nominations are now being accepted for 2019 induction. For more information and to submit a nomination, please contact Stefanie Krysiak at tel: 613 287-1515 ext. 101 or email skrysiak@equestrian.ca.